We’d love your help. Let us know what’s wrong with this preview of The Confession of Jack Straw by Simone Zelitch. 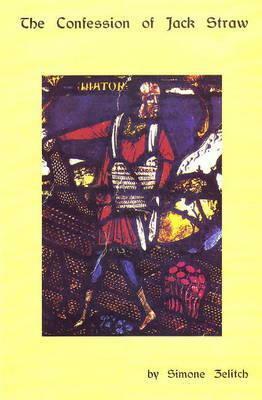 Ursula LeGuin said about this book: "In most novels about the Middle Ages, the deck is all face cards. Jack Straw is rare and admirable in its uncompromising, unpatronizing identification with a peasant—an intelligent, vulnerable man caught up in the dream of equality that flared into the Peasant Revolt. The novel lets the reader stand at that crossroads of politics and my Ursula LeGuin said about this book: "In most novels about the Middle Ages, the deck is all face cards. Jack Straw is rare and admirable in its uncompromising, unpatronizing identification with a peasant—an intelligent, vulnerable man caught up in the dream of equality that flared into the Peasant Revolt. The novel lets the reader stand at that crossroads of politics and mysticism and see 1776, 1848, 1917, Tiananment Square—the same dream, the same betrayal. A very moving, honest book." To ask other readers questions about The Confession of Jack Straw, please sign up. After reading Judenstaat, I was curious about what else Zelitch had written and came across this book dealing with the English Peasant Revolt in the 14th century. I'd never read any historical fiction dealing with this event, and I've always been interested in it. My own readings in history have shown me that every well intentioned revolution or revolt has been corrupted or co-opted for far less high-minded purposes. It neither surprised nor disappointed me that the same thing happened to the Pe After reading Judenstaat, I was curious about what else Zelitch had written and came across this book dealing with the English Peasant Revolt in the 14th century. I'd never read any historical fiction dealing with this event, and I've always been interested in it. My own readings in history have shown me that every well intentioned revolution or revolt has been corrupted or co-opted for far less high-minded purposes. It neither surprised nor disappointed me that the same thing happened to the Peasants' Revolt, but reading about it was a depressing experience. I did like Jack Straw's role as a storyteller. A couple of the stories he told were enjoyable, and I considered them high points in The Confession of Jack Straw.